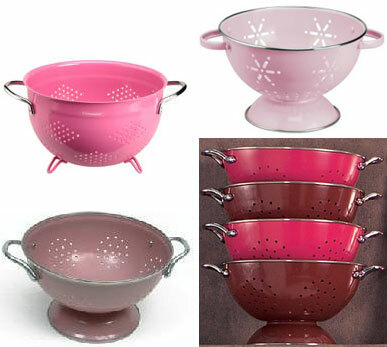 Clockwise from bottom left: Maxwell & Williams light pink colander (£11.95), shocking pink colander from Typhoon (large £10), Typhoon pale pink colander (£10), fuchsia pink colander from Matalan (£5). They have a very large stock of gorgeous cutsy pink things. Thanks for the store suggestion. Great minds must think alike as I was looking at that site just yesterday! I agree with some of the other people about this news. The loans seem to be essential for people, which are willing to organize their career. In fact, that is not really hard to receive a collateral loan.